Marc Quinn (British, born 1964) is a leading contemporary artist. He first came to prominence in the early 1990s, when he and several peers redefined what it was to make and experience contemporary art. 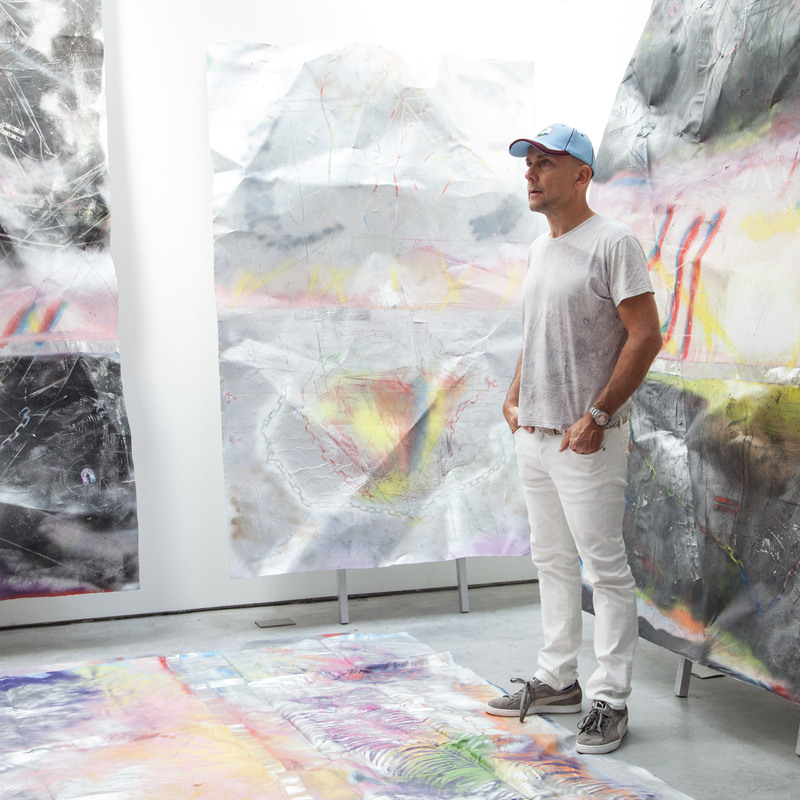 Marc Quinn makes art about what it is to be a person living in the world – whether it concerns Man’s relationship with nature and how that is mediated by human desire; or what identity and beauty mean and why people are compelled to transform theirs; or representing current, social history in his work. His work also connects frequently and meaningfully with art history, from Modern masters right back to antiquity. Quinn came to prominence in 1991 with his sculpture Self (1991, a cast of the artist’s head, made entirely of his blood, which is frozen and kept at sub-zero temperatures by its own refrigerated display unit. It is the purest form of self portrait (being of the artist - both in appearance and material) but also a comment on Man’s need for infrastructure, as the sculpture is kept ‘alive’ only by a mains electricity supply. This symbolism can be substituted for other forms of dependence, not least addiction - something the artist experienced early in his career. Other critically acclaimed works include Garden (2000), a full botanical garden frozen and displayed in Fondazione Prada, Milan; DNA Portrait of Sir John Sulston (2001), a genomic portrait of the genetic scientist Sir John Sulston, and Evolution (2005), ten sculptures depicting human embryos throughout the stages of its development. Major public installations include 1+1=3 (2002), a 20 metre artificial rainbow created for the Liverpool Biennale; Planet (2008), a monumental rendition of the artist’s son as a baby, permanently installed at The Gardens by The Bay Singapore; All of Nature Flows Through Us (2011), a ten meter bronze iris installed at Kistefos-Museet Norway; and Alison Lapper Pregnant (2005), a fifteen-ton marble statue of the heavily pregnant and disabled Alison Lapper, exhibited on the fourth plinth of London’s Trafalgar Square and later reinvented as a colossal inflatable sculpture, Breath (2012), for the 2012 Paralympics opening ceremony. Quinn has received international recognition for a series of sculptures of the model Kate Moss in a variety of yogic poses, including Siren (2008) - a solid gold sculpture of the model Kate Moss displayed at The British Museum, London. Quinn is also well known for his hyperrealist oil paintings of flowers and photorealist paintings of irises, created using an airbrush. Musée Océanographique, Monaco (2012), Fondazione Giorgio Cini, Venice (2013) and Arter, Space for Art, Istanbul (2014) and Somerset House, London (2015).